The Mini is a great platform that sees much street and track use. Mini owners hotly debate what parts are the best for their cars and you will find the SPC Control arms are always among the cream of the crop. When it comes to strength, performance, lightweight design, and Noise/Vibration/Harshness control the SPCs have few rivals and none with the blend of performance and comfort. 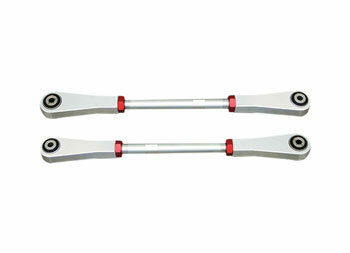 These control arms allow for rear camber adjustments of ±4.0º, they come in aluminium with clear anodized finish and signature SPC red fasteners. Light weight and hi-tech, you get high performance while maintaining ride comfort and low noise. This arm is perfect for Mini's that have been altered for show or performance use. Used on our VAC Motorsports Mini cooper. Large left/right hand threaded turnbuckle for simple adjustments while still installed. Purchase (2) sets to complete your adjustable rear suspension and control both camber and tow simultaneously. Applications:(MK1) BMW new Mini, Mini S & JCW.